Residents in the Tri-Valley area of the East Bay are outraged after seeing their water and sewage bills balloon and learning more rate hikes are looming. One Pleasanton resident received a bill for $1,500, almost doubling her previous bill. Water customers in the Zone 7 Water District, which includes Pleasanton, Livermore and Dublin, packed a Wednesday night water board meeting and made their voices heard. They carried signs, and they did their homework. The latest rate hike proposal was approved by the board, but residents said they will fight to get the hikes reversed. "People that I know through social media are angry," one resident said at the meeting in Livermore. "You don’t have a revenue problem; you have an expense problem," another resident said to the board. The latest increase, which includes a one-year surcharge, translates to an $8-a-month increase on an average household bill on Jan. 1. The Pleasanton homeowner whose bill totaled $1,500 said that price hike came before the rate hike that kicks in next month. 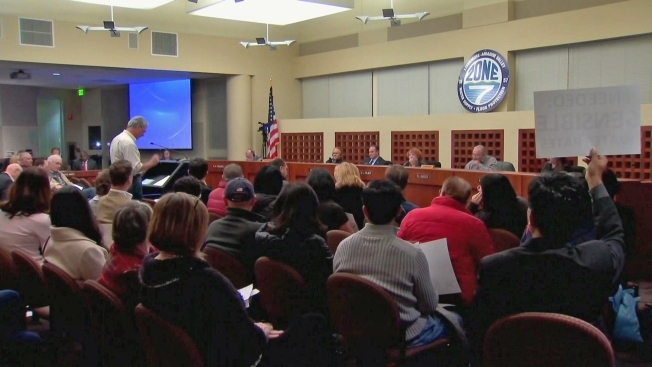 "We’re told Zone 7 has high fixed costs, and if they sell less water, they still have those fixed costs to cover," Pleasanton City Councilwoman Karla Brown said. The Zone 7 water agency said it is faced with a need to recover financial losses after four years of drought. But that's a hard pill to swallow for water savers like Victor Ahaev. He started conserving water three years ago and still saw a steady quarterly increase in his bill, from $95 to nearly $300. "I know we have to save; I just don’t trust them after these last two bills," Ahaev said.